KWID CONCEPT, a concept car unveiled at the Delhi Auto Expo, highlights both Renault's commitment to new markets, such as India, as well as the company's ability to produce appealing products in the compact car segment. The vehicle's robust, yet fun design, along with its technology-driven features, is targeted at meeting the needs of young customers in these markets. The KWID CONCEPT was designed with inputs from Renault Design India and is covered by the 'Explore' petal of Renault's lifecycle-based design strategy. 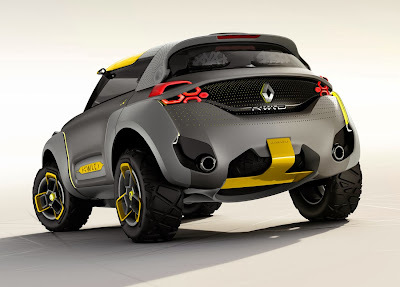 The vehicle's exciting proportions and dimensions as well as very short overhangs give the impression of a bouncing vehicle, while its oversized wheels protrude past the fenders and make the KWID CONCEPT look like a buggy car. The playfulness of the vehicle's exterior design is offset by a robust appearance due to its protective guards and chunky wings, which exude an impression of strength. The vehicle comes with a two-wheel drive transmission, but projects the facade of an off-road car. The interior of the KWID CONCEPT is designed to serve as a snug cocoon and is inspired by a bird's nest. The vehicle's seats, suspended over a solid base in white, give an impression of lightness, while their 2-tone elastomer material provides a sense of brightness. The KWID CONCEPT also features rear climate control with controls on the driver seat's back as well as ventilation through concentric perforations. The dashboard is an integrated tablet for commanding the navigation of the Flying Companion. Beyond the playful and imaginative styling of the KWID CONCEPT, the concept car also comes equipped with a host of technology-driven features, led by its Flying Companion. Aimed at offering a safe as well as fun driving experience, the Flying Companion is the first of its kind in the automotive world. 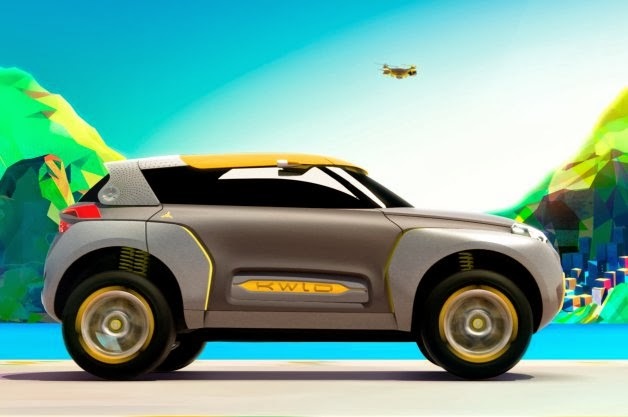 Taking off from the rotating rear portion of the KWID CONCEPT's roof, the Flying Companion can be operated in one of two modes – the automatic mode using a pre-programmed flying sequence and GPS location as well as the manual mode, which enables the companion to be controlled using a tablet inside the vehicle. The Flying Companion can be used for a variety of purposes, including scouting traffic, taking landscape pictures and detecting obstacles on the road ahead. "Customers in new markets are much younger. Their expectations are different and customers are basically gamers. They tend to take a closer interest in technology and want to enjoy themselves. This concept car meets those needs in a variety of ways, but mainly thanks to the Flying Companion which makes driving both safe and fun. This is the very first time in the long automotive history we can dry on earth with an eye in the sky. It's an amazing feature!" Serge Mouangue, Brand Manager and Innovative Cooperative Laboratory Manager. The KWID CONCEPT is also Z.E. ready - being pre-disposed to receive batteries for electric use - and comes with a charging plug behind the Renault logo. It's powered by the latest-generation downsized 1.2-litre petrol turbocharged engine mated to dual-clutch transmission EDC to combine driving enjoyment with low fuel consumption. Other technology-rich features include electric operated front bench seat on a center rail, electric opening doors, LED lighting, lack of gearshift (command with touches next to the steering). The vertically-mounted TFT touchscreen display acts as the dashboard in the KWID CONCEPT and also provides access to connected services. 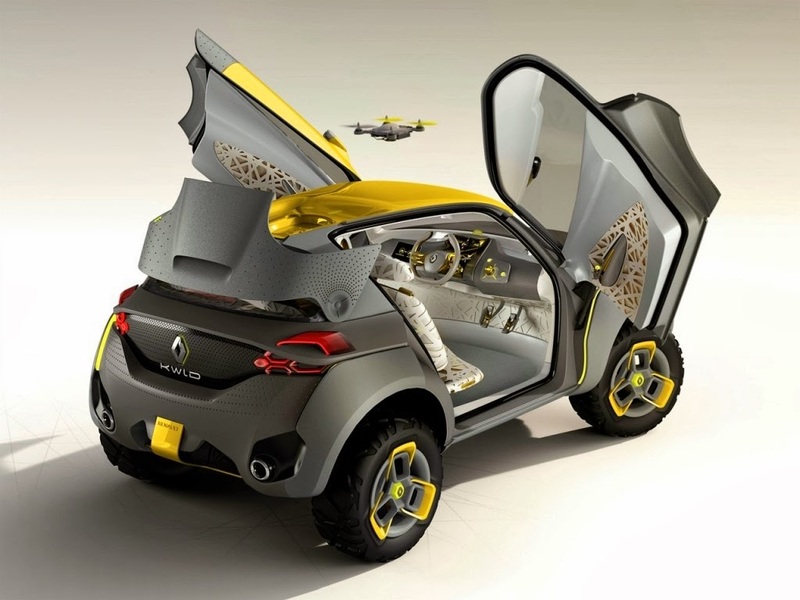 A multinational concept car, the KWID CONCEPT is the first of its kind in Renault to target new markets and Renault Designers around the world cooperated to conceive a vehicle made for local markets and designed to meet the latters' needs. The interior of the vehicle was designed by François Grenier (Technocentre Design, France) based on original drawings by Mishu Batra (Renault Design India) and the exterior by Anton Shamenkov (of Russian origins, Technocentre Design, France) based on original drawings by Jean Semeriva (Studio Design Brazil). The colors and materials of the vehicle were worked upon by Neha Lad (Indian trainee, Technocentre Design) and developed by Chie Yanagisawa (Japanese designer, Technocentre Design). Axel Breun (Technocentre Design) was the overall Project Manager. 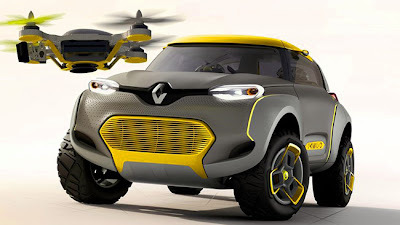 The first Renault concept car to be unveiled outside Europe, the KWID CONCEPT also emphasises India's significant place in Renault's global strategy as well as the company's ability to offer appealing products in the compact car segment. "This is the first time we have chosen to reveal a concept car outside Europe and this is an eloquent sign of our commitment to India. Young customers in India are often trend setters, looking forward to pushing the envelope when it comes to technology and enjoyable drives. The KWID CONCEPT, with its Flying Companion, meets this forward-looking spirit with both its dynamic styling and hyper connectivity." Gilles Normand, Chairman of Asia-Pacific Region, Renault S.A.S. The KWID CONCEPT is also tailored specifically to meet the needs of Indian drivers. The vehicle is a compact five-seater to enable family trips, a common occurrence in India. The multimedia dashboard, along with the Flying Companion, answers the young and modern Indian need to stay connected, with a strong attempt for technology. The vehicle's lightweight interior design is also adapted to warm weather conditions. The KWID CONCEPT 's two-tone body coloring consists of satin grey for the body and textured grey for functional parts as well as golden yellow for contrasting roof and air intake. The vehicle also sports yellow inserts on wheels, lower doors and perforated parts. While this colour scheme features the corporate colors of the Renault Group, the tones also evoke associations with India: the grey represents the soil, while the yellow and gold symbolise flowers and spices. Additionally, the KWID CONCEPT features an unusual seat arrangement, with three passengers up front and the driver seat in the middle, in a slightly forward position to offer shoulder room, as well as two seats at the back. The central driving position afforded by this arrangement meets international driving demands, enabling the car to driven in both right hand and left hand drive markets. "Renault has seen unparalleled growth in India in just under 3 years and the market is set to continue playing a significant role in the company's global strategy in the years to come." said Sumit Sawhney, Managing Director, Renault India Pvt. Ltd. "The reveal of the KWID CONCEPT in India – the first such unveil outside Europe, as well as its design keeping in mind the young customers in India illustrate our strong commitment to the country."